Design & Manufacturing of passenger aircraft, flying boats, fighter and bomber aircraft. Do-17s versatility was such that it was used as a bomber, reconnaissance plane and as a pathfinder by the Luftwaffe. The successful Do-24s flying boats were operated as long-range reconnaissance, transport and rescue aircraft in the Mediterranean, Dutch East Indies and Scandinavia. — possessed great potential as a combat aircraft, it simply ran out of time. 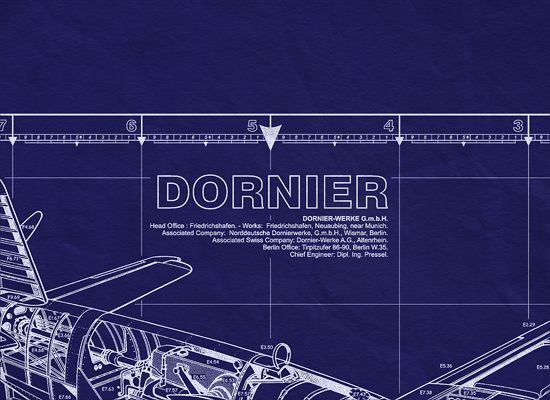 The Dornier Do-335 was said to be the fastest piston-engine aircraft of the War. As the Second World War in Europe drew to a close, a powerful new twin-engine fighter was preparing to enter service with the Luftwaffe. One of the more famous of the bizarre shapes which took to the air over Germany. — a brave attempt to provide the Luftwaffe with a potent fighter-bomber, night-fighter and reconnaissance platform. 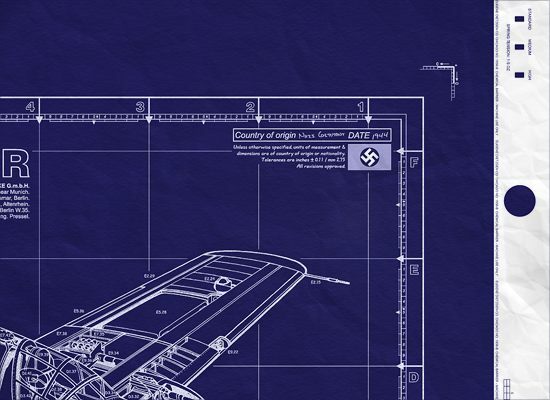 Continued from above… one can accuse the World War II German aircraft designers of conservatism and, while the majority of combat aircraft were of conventional design, there were many others which pushed the forefront of aeronautics. Unhampered by tradition, German designers sought fresh means to solve old problems, and in so doing provided the Allies in both East and West with a wealth of advanced research material following the end of hostilities. One of the most famous of the bizarre shapes which took to the air over Germany was the Dornier Do-335 Pfeil, a brave attempt to provide the Luftwaffe with a potent fighter-bomber, night-fighter and reconnaissance platform. Photo right: This aircraft is awaiting transport back to the US, entering the war too late due to the rapid deterioration of German development programs and resources. The Luftwaffe was desperate to get the design into squadron use, but delays in engine deliveries meant only a handful were delivered before the war ended. French fighter ace Pierre Clostermann intercepted a lone Do-335 in April 1945 - the German aircraft evading and easily outrunning him. The Do-335 had a number of unusual distinctions... It was the only military aircraft of the time to have a push-pull powerplant/airframe. It was one of the few aircraft of WWII to have an ejection seat. It was the only aircraft that had explosive bolts in the rear fuselage designed to separate the tail section in order to facilitate a successful bail-out if necessary. It was the fastest production piston-engined fighter ever built, attaining 474 mph per hour (846 kilometers) in level flight at a time when the official world speed record was 755 kph (469 mph). Nothing in the Allied inventory could catch it. The ingenious German engineers who designed it envisioned it being a deadly fighter, capable of shooting down invading B-17's with ease. Numerous Do-335 prototypes were built, as the Reich strained desperately to provide day and night fighters and fast reconnaissance aircraft to the failing war effort. A large airplane by any standard, the rugged 335 weighs more than 18,000 pounds with standard equipment and loading, actually tops 22,000 pounds in certain sub?types. With wing span and length of approximately 45 feet, it was originally built as a single seater only to emerge during the last year of war with a pig-a-back seating arrangement for training and reconnaissance utilization. The most unconventional piston-engined fighter to be developed by the German aircraft industry during the war was, without doubt, the Do 335 Pfiel (Arrow) which featured one engine in the nose driving an orthodox tractor airscrew and a second engine amidships in the fuselage driving a pusher airscrew behind the tail. This unique configuration was patented by Dr. Claude Dornier in 1937, and to provide data on the effects of a pusher airscrew driven by an extension shaft and mounted aft of a cruciform tail, a small experimental aircraft, the Go 9, embodying these features, was built by Schemp-Hirth at Wusterberg, and was flown in 1940 with an 80 h.p. Hirth HM 60R engine. 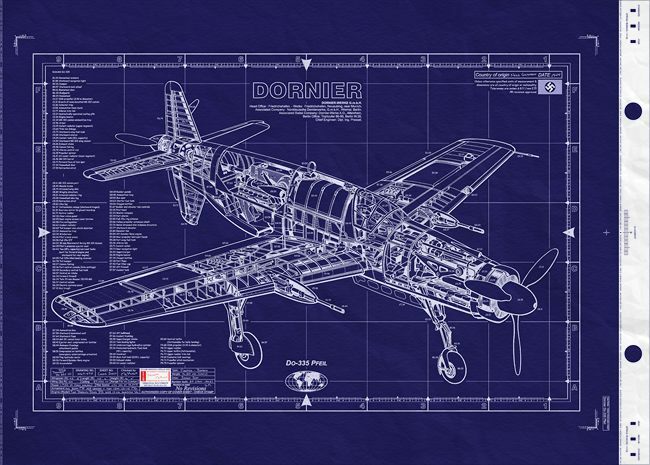 Tests with the Go 9 confirmed the feasibility of the arrangement, and the Dornier design team began work on the Do 231 single-seat intruder which carried a 2,200-lb. bomb load internally. Changes in operational requirements resulted in the cancellation of the Do 231, and in 1942 the design was reworked as the Do 335, the first prototype, the Do 335VI, a single-seater powered by two 1,800 h.p. DB 603E engines, flying for the first time in the autumn of 1943. At this time, thirty-eight aircraft had been ordered: fourteen Versuchs (experimental) machines, ten pre-production Do 335A-0s, eleven Do 335A-ls, and three two-seat conversion trainer models (A-10 and A-12). The Do 335V2 was similar to the VI but was destroyed at Oberpfaffenhofen during manufacturer's trials, and the V3 was also similar, but the V4 was intended to serve as a test-bed for a more advanced development of the basic design, the Do 435 side-by-side two-seat night fighter powered by Jumo 222 engines. The Do 335V5 was the first prototype to carry armament and was used for trials at Tarnewitz, having twin 15-mm. MG 151 cannon mounted over the forward engine and a 30-mm. MK 103 cannon firing through the airscrew boss; the V6 and V7 were retained by Dornier as test airframes, and the V8 was delivered to Daimler-Benz's flight test division. Apart from the Do 335V4, all these prototypes were single-seaters, as was also the Do 335V9 production prototype delivered to the Rechlin test centre for official trials in the summer of 1944. By this time the ten pre-production Do 335A-0 fighter-bombers had reached an advanced stage of assembly, and began to join the test program in the autumn of 1944. These were single-seat fighter-bombers carrying a 1,100-lb. bomb load, one 30-mm. MK 103 and two 15-mm. MG 151 cannon. The initial production model, the Do 335A-1 Pfiel single-seat day and night fighter-bomber, differed principally in having 1,900 h.p. DB 603G engines, and these were delivered in January-February 1945, although service pilots experienced some difficulty in handling the aircraft, which were prone to "porpoising" and "snaking" at high speeds. The Do 335A-4 was a reconnaissance variant with two RB 50/30 cameras. Several two-seat variants of the Pfiel were being developed in parallel with the single-seater, including the Do 335V10 with 1,750 h.p. DB 603A-1 engines, the second cockpit for the radio and radar operator being installed immediately behind and slightly above that of the pilot, FuG 220 radar antennae being attached to the wing leading edges. The V13 and V14 were also two-seaters, these serving as prototypes for the Do 335A-10 and A-12 conversion trainers. 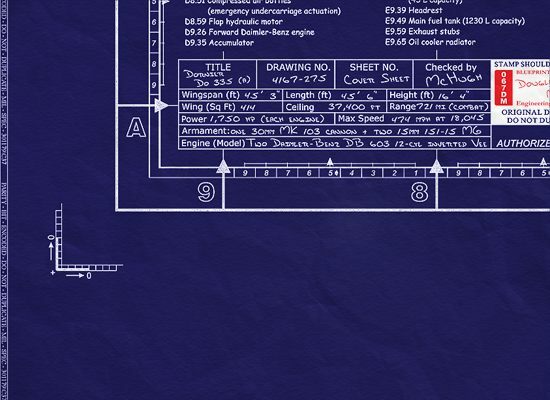 During the closing stages of the war, work had commenced on the B-series intended specifically for the heavy day fighter and night fighter roles. The Do 335V13 and V14 were prototypes for the single-seat Do 335B-2 destroyer which, powered by DB 603E engines, differed from the A-l principally in having a heavier forward-firing armament, a 30-mm. MK 103 cannon being mounted in the leading edge of each wing, the total armament being three MK 103s and two 20-mm. MG 151s. The installation of the wing-mounted MK 103s was unusual in that the complete cannon hinged downward, pivoting on the forward extremity of the fairing, to simplify maintenance. Several other B-series variants were planned when the Oberpfaffenhofen plant was occupied by the Allies. These included the Do 335B-3 which was similar to the B-l apart from the use of DB 603LA engines with two-stage superchargers and rated at 2,100 h.p. for takeoff; the Do 335B-4 which, in order to make the best use of the high altitude characteristics of the DB 603LA engine, employed a redesigned wing of higher aspect ratio spanning 60 ft. 4.5 in. ; the Do 335B-6 two-seat night fighter similar to the A-6; the Do 335B-7 similar to the B-6 apart from the use of DB 603LA engines, and the Do 335B-8 with the enlarged wing of the B-4. Another projected development was the Do 635 which comprised two Do 335s connected by a new centre section between the fuselages. In the long-range reconnaissance role, the Do 635 was expected to attain an ultimate range of 4,050 miles at 398 m.p.h. at 21,300 ft.
At the end of the war a few Do 335A-l single-seaters had been delivered to the Luftwaffe, these were not believed to have been encountered operationally. The following specification relates to this model. Power Plants: Two 1,900 h.p. Daimler-Benz DB 603 G twelve-cylinder inverted-Vee liquid-cooled engines. Armament: One 30-mm. MK 103 cannon with 70 rounds and two 15-mm. MG 151 cannon with 200 r.p.g. plus 1,100-/6. bomb load. Performance: Maximum speed, 413 m.p.h. at 26,200 ft.; service ceiling, 37,400//. ; maximum range (398 Imp. gal. internally and 527 Imp. gal. in external tank), 2,330 mls. at 385 m.p.h. at 19,680 ft.; normal range, 1,280 mls. at 295 m.p.h. at 19,680 ft. Weights: Empty, 16,314 lb. ; normal loaded, 21,186 lb. ; maximum, 25,800 lb. Dimensions: Span, 45 ft. 3.3 in. ; length, 45 ft. 5.25 in. ; height, 16 ft. 4.75 in. ; wing area, 414.41 sq.ft.